*Disclaimer: This post is sponsored by Sabra. All content and opinions are always my own. We’re in the last few months of this year, friends . . . what-the-what?! Summer is winding down and I have to admit, it’s been a good one for us Smith Bites. Work projects haven’t allowed us as much garden time as we’d have liked (Halp!! The weeds have taken over!) but there have been plenty of naps on the deck, books read and floating in the pool – we’ll take it. Summer meals are pretty laid back and less fussy; our garden provides seasonal herbs, lettuces and tomatoes as well as whatever vegetables the groundhog doesn’t eat . . . all we need to decide is what protein we’ll be grilling for dinner-al-fresco. One of our favorite dips to keep stocked in the fridge for easy meals are Sabra Tzatsiki Dips; they can be used in a variety of ways: obviously you can use nearly any veggie and dip to your heart’s content, but they also make a great spread on sandwiches and wraps in lieu of mayo. Tzatziki dips also play nice as a topping on grilled fish and meats; think Cucumber Dill on cedar-planked grilled salmon (add a few drops of Sriracha for a bit of heat), Spinach Parmesan on grilled chicken, Classic on lamb kabobs and The Professor and I have used Ranch on Taco salad made with smoky, grilled romaine. 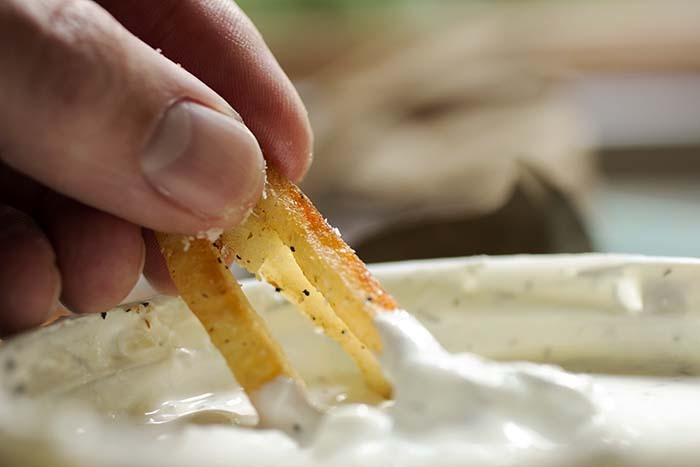 Needless-to-say, Sabra’s Tzatziki dips taste great and are very versatile. Baked sweet potatoes are standard fare in our kitchen – but when I’m feeling naughty, I up my game and toss some frozen french fries in a bit of melted duck fat, salt and pepper, throw them on a lined sheet pan and bake in a super hot oven. 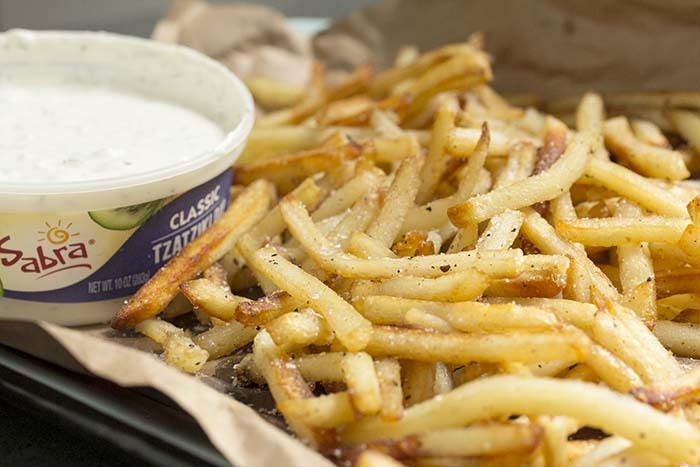 About 20-minutes later, I have gorgeous, crispy-on-the-outside, fluffy-on-the-inside, easy duck frites – without deep frying and they’re perfect for dipping in Sabra’s Tzatziki Classic! 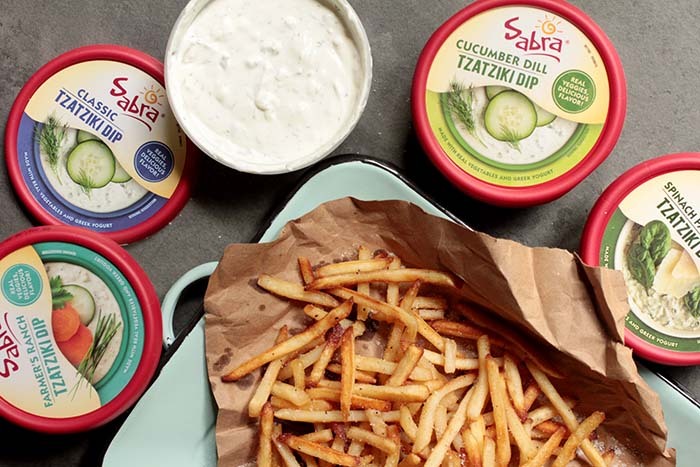 Sabra Tzatziki Dips are now available at your local Kroger and Sam’s Club – don’t forget to download the coupon from Sabra!